The weekend of 14th-15th April saw the culmination of the Mens and Womens Super 8’s league for 2011-12 season in Kettering. 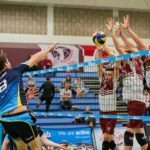 Saturday saw Polonia face Team Northumbria in the semi final with winner having the right to play against Leeds Carnegie for the Super 8 league title. With already two loses against Northumbria before the playoffs Polonia had a point to prove. In a titanic battle Polonia were not going to let their title (of last year’s champions) go. Polonia triumphed in a five setter and would play Leeds for the title. We would also like to thank everyone who came to support on the day and a massive thank you to everyone who watched / streamed and supported online. The two teams will once again go head to head in the National Cup Final in two weeks time.